BBC Television is a service of the British Broadcasting Corporation. The corporation has operated in the United Kingdom under the terms of a royal charter since 1927. It produced television programmes from its own studios since 1932, although the start of its regular service of television broadcasts is dated to 2 November 1936. The BBC's domestic television channels have no commercial advertising and collectively they account for more than 30% of all UK viewing. The services are funded by a television licence. The BBC operates several television networks, television stations (although there is generally very little distinction between the two terms in the UK), and related programming services in the United Kingdom. As well as being a broadcaster, the corporation also produces a large number of its own programmes in-house and thereby ranks as one of the world's largest television production companies. John Logie Baird set up the Baird Television Development Company in 1926; on 30 September 1929 he made the first experimental television broadcast for the BBC from its studio in Long Acre in the Covent Garden area of London via the BBC's London transmitter. Baird used his electromechanical system with a vertically-scanned image of 30 lines, which is just enough resolution for a close-up of one person, and a bandwidth low enough to use existing radio transmitters. The simultaneous transmission of sound and pictures was achieved on 30 March 1930, by using the BBC's new twin transmitter at Brookmans Park. By late 1930, thirty minutes of morning programmes were broadcast from Monday to Friday, and thirty minutes at midnight on Tuesdays and Fridays after BBC radio went off the air. Baird's broadcasts via the BBC continued until June 1932. The BBC began its own regular television programming from the basement of Broadcasting House, London, on 22 August 1932. The studio moved to larger quarters in 16 Portland Place, London, in February 1934, and continued broadcasting the 30-line images, carried by telephone line to the medium wave transmitter at Brookmans Park, until 11 September 1935, by which time advances in all-electronic television systems made the electromechanical broadcasts obsolete. After a series of test transmissions and special broadcasts that began in August 1936, the BBC Television Service officially launched on 2 November 1936 from a converted wing of Alexandra Palace in London. "Ally Pally" housed two studios, various scenery stores, make-up areas, dressing rooms, offices, and the transmitter itself, which then broadcast on the VHF band. BBC television initially used two systems on alternate weeks: the 240-line Baird intermediate film system and the 405-line Marconi-EMI system. The use of both formats made the BBC's service the world's first regular high-definition television service; it broadcast from Monday to Saturday between 15:00 and 16:00, and 21:00 and 22:00. 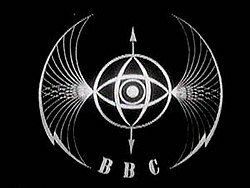 The first programme broadcast – and thus the first ever, on a dedicated TV channel – was "Opening of the BBC Television Service" at 15:00. The first major outside broadcast was the coronation of King George VI and Queen Elizabeth in May 1937. The two systems were to run on a trial basis for six months; early television sets supported both resolutions. However, the Baird system, which used a mechanical camera for filmed programming and Farnsworth image dissector cameras for live programming, proved too cumbersome and visually inferior, and ended with closedown (at 22:00) on Saturday 13 February 1937. Initially, the station's range was officially a 40 kilometres radius of the Alexandra Palace transmitter—in practice, however, transmissions could be picked up a good deal further away, and on one occasion in 1938 were picked up by engineers at RCA in New York, who were experimenting with a British television set. [a] The service was reaching an estimated 25,000–40,000 homes before the outbreak of World War II which caused the service to be suspended in September 1939. On 1 September 1939, two days before Britain declared war on Germany, the station was taken off air with little warning; the government was concerned that the VHF transmissions would act as a beacon to enemy aircraft homing in on London. Also, many of the television service's technical staff and engineers would be needed for the war effort, in particular on the radar programme. The last programme transmitted was a Mickey Mouse cartoon, Mickey's Gala Premier (1933), which was followed by test transmissions; this account refuted the popular memory according to which broadcasting was suspended before the end of the cartoon. According to figures from Britain's Radio Manufacturers Association, 18,999 television sets had been manufactured from 1936 to September 1939, when production was halted by the war. BBC Television returned on 7 June 1946 at 15:00. Jasmine Bligh, one of the original announcers, made the first announcement, saying, 'Good afternoon everybody. How are you? Do you remember me, Jasmine Bligh?'. The Mickey Mouse cartoon of 1939 was repeated twenty minutes later. Alexandra Palace was the home base of the channel until the early 1950s when the majority of production moved into the newly acquired Lime Grove Studios. Postwar broadcast coverage was extended to Birmingham in 1949 with the opening of the Sutton Coldfield transmitting station, and by the mid-1950s most of the country was covered, transmitting a 405-line interlaced image on VHF. When the ITV was launched in 1955, the BBC Television Service (renamed "BBC tv" in 1960) showed popular programming, including comedies, drama, documentaries, game shows, and soap operas, covering a wide range of genres and regularly competed with ITV to become the channel with the highest ratings for that week. The channel also introduced the science fiction show Doctor Who on 23 November 1963 - at 17:16 - which went on to become one of Britain's most iconic and beloved television programmes. BBC TV was renamed BBC1 in 1964, after the launch of BBC2 (now BBC Two), the third television station (ITV was the second) for the UK; its remit, to provide more niche programming. The channel was due to launch on 20 April 1964, but was put off the air by a massive power failure that affected much of London, caused by a fire at Battersea Power Station. A videotape made on the opening night was rediscovered in 2003 by a BBC technician. In the end the launch went ahead the following night, hosted by Denis Tuohy holding a candle. BBC2 was the first British channel to use UHF and 625-line pictures, giving higher definition than the existing VHF 405-line system. On 1 July 1967, BBC Two became the first television channel in Europe to broadcast regularly in colour, using the West German PAL system that was in use for decades until being gradually superseded by digital systems. (BBC One and ITV began 625-line colour broadcasts simultaneously on 15 November 1969). Unlike other terrestrial channels, BBC Two does not have soap opera or standard news programming, but a range of programmes intended to be eclectic and diverse (although if a programme has high audience ratings it is often eventually repositioned to BBC One). The different remit of BBC2 allowed its first controller, Sir David Attenborough to commission the first heavyweight documentaries and documentary series such as Civilisation, The Ascent of Man and Horizon. Attenborough was later granted sabbatical leave from his job as Controller to work with the BBC Natural History Unit which had existed since the 1950s. This unit is now famed throughout the world for producing high quality programmes with Attenborough such as Life on Earth, The Private Life of Plants, The Blue Planet, The Life of Mammals, Planet Earth and Frozen Planet. National and regional variations also occur within the BBC One and BBC Two schedules. England's BBC One output is split up into fifteen regions (such as South West and East), which exist mainly to produce local news programming, but also occasionally opt out of the network to show programmes of local importance (such as major local events). The other nations of the United Kingdom (Wales, Scotland and Northern Ireland) have been granted more autonomy from the English network; for example, programmes are mostly introduced by local announcers, rather than by those in London. BBC One and BBC Two schedules in the other UK nations can vary immensely from BBC One and BBC Two in England. Programmes, such as the politically fuelled Give My Head Peace (produced by BBC Northern Ireland) and the soap opera River City (produced by BBC Scotland), have been created specifically to cater for some viewers in their respective nations. BBC Scotland produces daily programmes for its Gaelic-speaking viewers, including current affairs, political and children's programming such as the popular Eòrpa and Dè a-nis?. BBC Wales also produces a large amount of Welsh language programming for S4C, particularly news, sport and other programmes, especially the soap opera Pobol y Cwm ('People of the Valley') briefly shown on BBC2 across the UK with subtitles in the 1990s. The UK nations also produce a number of programmes that are shown across the UK, such as BBC Scotland's comedy series Chewin' the Fat, and BBC Northern Ireland's talk show Patrick Kielty Almost Live. During the 1980s, the BBC came under pressure to commission more programmes from independent British production companies, and following the Broadcasting Act 1990 it was legally required to source 25% of its output from such companies by the terms of the Act. This eventually led to the creation of the "WoCC" (Window of Creative Competition) for independent production companies to pitch programmes to the BBC. Programmes have also been imported mainly from English-speaking countries: notable—though no longer shown—examples include The Simpsons from the United States and Neighbours from Australia. Programming from countries outside the English-speaking world consisted of feature films, shown in the original language with subtitles instead of being dubbed, with dubbing only used for cartoons and children's programmes. These included programmes from Eastern Europe, including The Singing Ringing Tree from East Germany, although voice-over translation was used instead of dubbing for budgetary reasons. Ceefax, the first teletext service, launched on 23 September 1974. This service allowed BBC viewers to view textual information such as the latest news on their television. CEEFAX did not make a full transition to digital television, instead being gradually replaced by the new interactive BBCi service before being fully closed down on 22 October 2012. In March 2003 the BBC announced that from the end of May 2003 (subsequently deferred to 14 July) it intended to transmit all eight of its domestic television channels (including the 15 regional variations of BBC 1) unencrypted from the Astra 2D satellite. This move was estimated to save the BBC £85 million over the next five years. While the "footprint" of the Astra 2D satellite was smaller than that of Astra 2A, from which it was previously broadcast encrypted, it meant that viewers with appropriate equipment were able to receive BBC channels "free-to-air" over much of Western Europe. Consequently, some rights concerns have needed to be resolved with programme providers such as Hollywood studios and sporting organisations, which have expressed concern about the unencrypted signal leaking out. This led to some broadcasts being made unavailable on the Sky Digital platform, such as Scottish Premier League and Scottish Cup football, while on other platforms such broadcasts were not disrupted. Later, when rights contracts were renewed, this problem was resolved. The BBC Television department headed by Jana Bennett was absorbed into a new, much larger group; BBC Vision, in late 2006. The new group was part of larger restructuring within the BBC with the onset of new media outlets and technology. In 2008, the BBC began experimenting with live streaming of certain channels in the UK, and in November 2008, all standard BBC television channels were made available to watch online via BBC iPlayer. When Tony Hall became Director General in April 2013, he reverted the division to its original name of BBC Television. As Television it was responsible for the commissioning, scheduling and broadcasting of all programming on the BBC's television channels and online, as well as producing content for broadcast. Following the 2016 Licence Fee settlement, BBC Television was split into two divisions, with in-house television production being separated into a new division called BBC Studios controlled by Mark Linsey and the remaining parts of television (channels and genre commissioning, BBC Sport, BBC Three and BBC iPlayer) being renamed as BBC Content, controlled by Charlotte Moore. As a result, the BBC Television division is now known internally as BBC Content and "BBC Television" as an entity has ceased to exist. The BBC domestic television channels do not broadcast advertisements; they are instead funded by a television licence fee which TV viewers are required to pay annually. This includes viewers who watch real-time streams or catch up services of the BBC's channels online or via their mobile phone. The BBC's international television channels are funded by advertisements and subscription. These channels are also available outside the UK in neighbouring countries e.g. Belgium, the Netherlands and the Republic of Ireland. The Corporation's primary network, broadcasting mainstream comedy, drama, documentaries, films, news, sport, and some children's programmes. BBC One is also the home of the BBC's main 30-minute news bulletins, currently shown at 13:00, 18:00, and 22:00 (on weekdays; times vary for weekend news bulletins) and overnight bulletins from BBC World News every Monday to Sunday. The main news bulletins are followed by local news. These are provided by production centres in Wales, Scotland and Northern Ireland and a further 14 regional and sub-regional centres in England. The centres also produce local news magazine programming. Shutdown of all UK analogue television stations began in 2008 and finished in October 2012, leaving only digital transmission for terrestrial services. A high definition simulcast, BBC One HD, launched on 3 November 2010. Home to more specialist programming, including comedy, documentaries, dramas, children's programming and minority interest programmes, as well as imported programmes from other countries, particularly the United States. An important feature of the schedule is Newsnight, a 50-minute news analysis programme shown each weeknight at 22.30. There are slight differences in the programming for England, Wales, Northern Ireland and Scotland. The most notable is a separate final 20 minutes for Newsnight broadcast in Scotland. A high definition simulcast, BBC Two HD, launched on 26 March 2013. Niche programming for an intellectual audience, including specialist documentaries, occasional 'serious' dramas, live theatre, foreign language films and television programmes and 'prestige' archive television repeats. A high definition simulcast, BBC Four HD, launched on 10 December 2013. A high definition simulcast, BBC News HD, launched on 10 December 2013. The Corporation's dedicated politics channel, covering both the UK Parliament, Scottish Parliament, Welsh Assembly, Northern Ireland Assembly, and international politics. For children aged seven and above. A high definition simulcast, CBBC HD, launched on 10 December 2013. A high definition simulcast, CBeebies HD, launched on 10 December 2013. Although this Welsh language channel is not operated by the Corporation, the BBC contributes programmes funded by the licence fee as part of its public service obligation. The BBC used to broadcast Welsh-language programmes on its own channels in Wales, but these were transferred to S4C when it started broadcasting in 1982. A part-time Scottish Gaelic channel. Although it carries the BBC name, it is a partnership between the BBC and MG Alba, with the majority of funding coming from the Scottish Government via MG Alba. Scottish Gaelic programmes were also shown on BBC Two in Scotland – subject to approval from the BBC Trust, but moved to BBC Alba after digital switchover. Home to mainly programming geared towards 16-34-year olds, particularly new comedy sketch shows and sitcoms. A high definition simulcast, BBC Three HD, launched on 10 December 2013. On 16 February 2016, BBC Three moved as an online-only content. An international, commercially-funded twenty-four-hour news channel, not officially available to UK viewers but is shown on BBC News/BBC One/BBC Two between 00:00-05:30 and at 19:00–19:30 on BBC Four and 21:00-22:00 on BBC News Channel. A US general entertainment channel, distributed in co-operation with AMC Networks, showcasing British television programming. A news and factual programming channel broadcast to the Middle East and North Africa. It was launched on 11 March 2008. An entertainment subscription television channel featuring male-skewed factual entertainment programming. Launched 1 February 2015 in Poland, April 2015 for Denmark, Norway, Sweden, Finland and Iceland replacing BBC Entertainment. A Canadian general entertainment channel, co-owned with Corus Entertainment. showing Canadian and British television programming. Broadcasts comedy, drama, light entertainment and children's programming by BBC and other UK production houses, available in the following regions: Europe (except Scandinavia and Eastern Europe), Turkey and Israel. An entertainment subscription television channel featuring drama, crime and comedy programming. The channel kicked off in Australia on 3 August 2014. Currently available in the following regions: Asia, Australia (BBC First (Australia)), Benelux (BBC First (Dutch TV channel)), Central and Eastern Europe (Croatia, Macedonia, Poland and Slovenia), Middle East & North Africa and South Africa. A high-definition channel gradually replaced by other BBC Studios channels, currently still available in Turkey. A Canadian children's programming channel co-owned with Knowledge West Communications. Documentaries and factual programming, currently available in Australia and New Zealand. Lifestyle programming, currently available in Asia, Poland and South Africa. An entertainment channel in Australia and New Zealand, carrying drama and comedy programmes from the BBC, Talkback Thames, ITV, and Channel 4. Commercial television network in the United Kingdom, co-owned with Discovery Inc. The channels broadcast mainly BBC archive and specially produced programming. News channel that targets Persian-speaking countries including Iran, Afghanistan and Tajikistan in the Persian/Dari/Tajiki language. BBC Japan was a general entertainment channel, which operated between December 2004 and April 2006. It ceased operations after its Japanese distributor folded. British Broadcasting Company, Ltd., for a history of the BBC prior to 1927. Timeline of the BBC for an overview of BBC history. ^ They filmed the static-ridden output they saw on their screen, and this poor-quality mute film footage is the only surviving record of 1930s British television filmed directly from the screen. Some images of programmes do survive in newsreels, which also contain footage shot in studios while programmes were being made, giving a feel for what was being done, albeit without directly replicating what was being shown on screen. Wikimedia Commons has media related to BBC Television. ^ a b c "Who we are and how we commission". BBC. 2016. Retrieved 19 November 2016. ^ "BBC Television - 2 November 1936 - BBC Genome". genome.ch.bbc.co.uk. ^ "History of the BBC". BBC. ^ Burns, R.W. (1998). Television: An International History of the Formative Years. London: The Institution of Electrical Engineers. pp. ix. ISBN 978-0-85296-914-4. ^ a b "The edit that rewrote history – Baird". Transdiffusion Broadcasting System. 31 October 2005. Retrieved 28 May 2007. ^ TV Technology 8. Britain In Colour – and UHF. Screenonline, Richard G. Elen. Retrieved: 26 November 2010. ^ "BBC - Press Office - BBC One and BBC Two to be simulcast from 27 November". www.bbc.co.uk. ^ "Television". BBC. 2014. Retrieved 19 March 2014. ^ "Mark Linsey is the new Director of BBC Studios". BBC Press Office. 22 March 2016. ^ "BBC - BBC Earth to Launch in Asia - Media Centre". www.bbc.co.uk. Retrieved 24 July 2015.